A few days ago, I encouraged you to consider opening a Facebook account and connecting with people, including perhaps some client or boss type people. Jeff Gambill commented on the post that he’d never considered doing that, but probably will sign up for Facebook as a possible way to get some more work for his small construction business. Jeff recently discovered ConstructionKnowledge.net and has been a long time fan of learning and improving his skills and understanding of other trades. As I thought more about Facebook and marketing in general, I remembered an “Ah Ha” moment I had 20 years ago. I was running a General Contracting firm with about 80 people. A past customer started a project with another GC. Our sales guy called on the past customer to find why he hadn’t come back to us. Had we done something wrong that we didn’t know? Had there been problems with the last project that he never told us? We need marketing becuase customers forget. They have their busy lives and don’t think about us much. So whether you run a business or your own career (and I’m convinced there isn’t much difference between the two), you need to remind possible clients or bosses of your existence. Imagine setting up a Facebook account and friending most of the people in your email directory. Only the ones currently on Facebook get notified, and most of them will probably accept your friend request. Now you have some people who see your posts. You may post on your wall that you’ve been calling around for work, never having seen it quite this bad before. Not whining or begging, just commenting on what you are doing and thinking. A potential customer (or boss) may see that post and be spurred to action. Lots of projects are happening right now because the customers have been thinking about the project for years, but no one expressed much interest in taking them on. Now the call requesting a quote gets promptly answered and the bid given. The starting time becomes as soon as the permit clears. Besides getting you remembered, marketing motivates customers to take action. Wendy’s doesn’t advertise because they’ve got money to waste. They spend all those dollars on ads because the ads encourage customers to act in ways they wouldn’t have. Adding some offices differs from buying a Frosty, but the advertising works the same. So, as you manage your career or your business, think about marketing as a way to make customers remember who you are and what you could do for them. Make the time and take the risk. I stumbled across this quick construction video that I guarantee will cause the same grimace for every man that watches it. Any time a video clip ends with “Dude, are you all right?” you know it can’t be good. Last week, Facebook surpassed Google to become the most visited website in the U.S. That means that more people logged on to see what their friends were doing on Facebook than executed searches on Google. 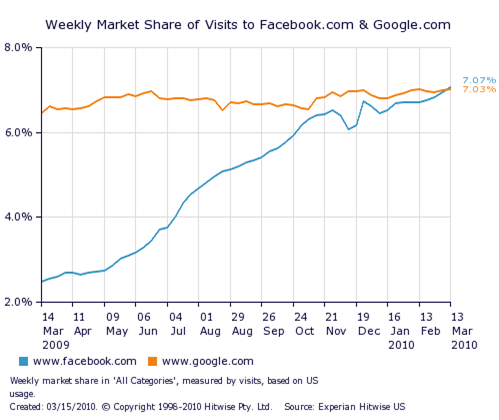 Just to give a sense of their scale, last week Google and Facebook combined for 14% of all website visits. So why should those of us in construction care about internet social media? Well, the construction world, along with the rest of the world, becomes more interconnected and complicated every year. Being great at what you do is still the best insurance policy for success in hard times. Yet, that competence may not be enough. Some self-promotion and networking just may be required for you to keep working in these challenging times. I don’t particularly like it, but that’s the way it is. So you would be wise to stay somewhat current with these social networking trends. Do you have a Facebook account? If not, I encourage you to sign up for one. The process is simple. You can go to the “find friends” screen and let Facebook access your email. Then anyone who you have emailed who is on Facebook will come up as a possible friend. That attribute makes it easy to find people. Maybe one of those people will play a part in hooking you up with your next job. Go to HubSpot if you want to better understand web traffic and analytics. Yesterday the International Code Council published the first draft of the International Green Construction Code. I think this is an important step to make sustainable building practices the norm rather than something only rich owners specify. The LEED certification process was a good way to start the process and move the industry toward consensus, but lacks the clarity of code language. Similarly, the Americans with Disability Act (ADA) moved us toward accessible design, but was terrible to work under until the ANSI/ICC A117.1 Accessible and Usable Buildings and Facilities was produced. As an example, the ADA required the toilet center-line be 18″ from the wall. We had inspectors conclude they weren’t authorized to allow 17 7/8″. When A117 came out with that requirement clarified to be 16″ to 18″, we all knew we were working with a tolerance that was achievable. So, if you are interested in sustainable building design and construction, download the public comment version of the International Green Construction Code and study through it. You will make yourself a more valuable industry asset and learn a few things in the process. If you have some extra time available due to the economy, use it to learn. Celebrate your interest and aptitude for learning…it’s one of life’s great joys. I never seem to get tired of watching things get blown up. Here’s a good video clip of two smokestacks in St Louis that were imploded last year. As always, don’t try this at home. Imagine the guys that built those smoke stacks…assembling the scaffolding (probably all wooden), laying brick day after day for weeks, and showing their families what they built when completed. Now, in five seconds, those stacks become a pile of rubble. The circle of life continues. By the way, this is the first YouTube video I noticed that Google put a related advertisement at the bottom. What will those Googlers monetize next? 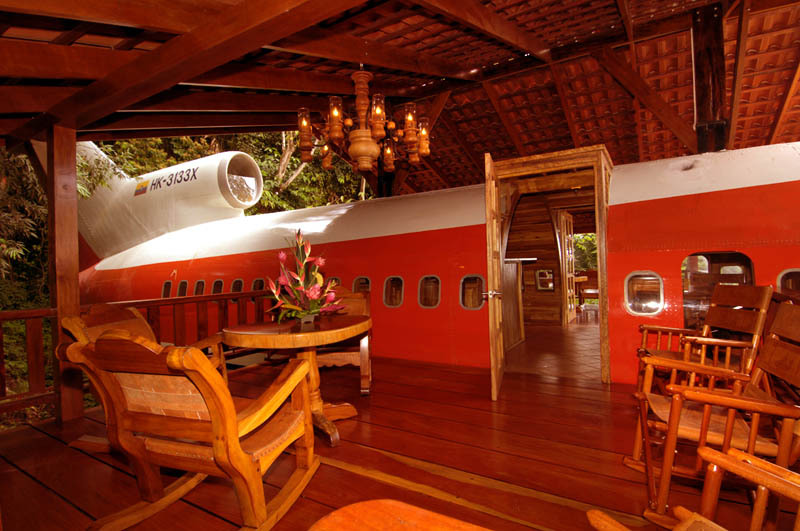 I came across some more airplane house photos at Dark Roasted Blend that are fun. 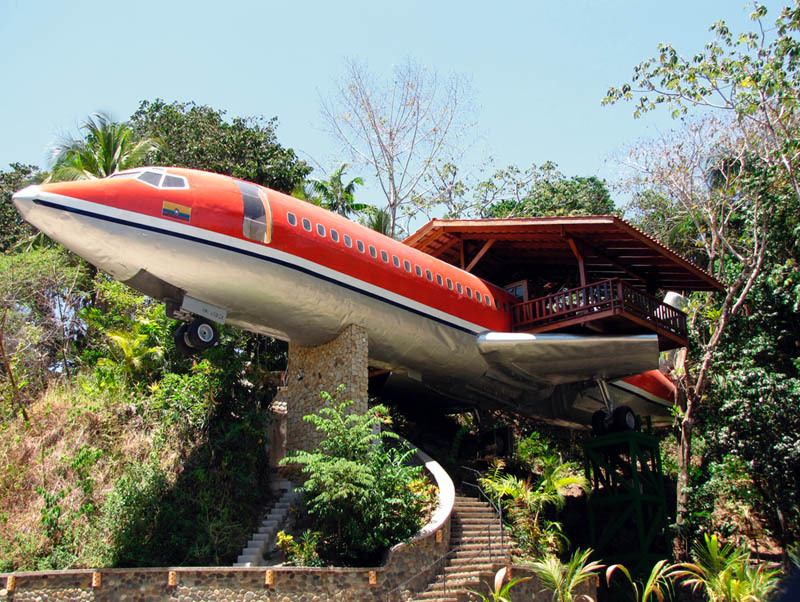 This Boeing 727 found a new life as an abode in Costa Rica. I love the creativity and workmanship shown in the photos below. 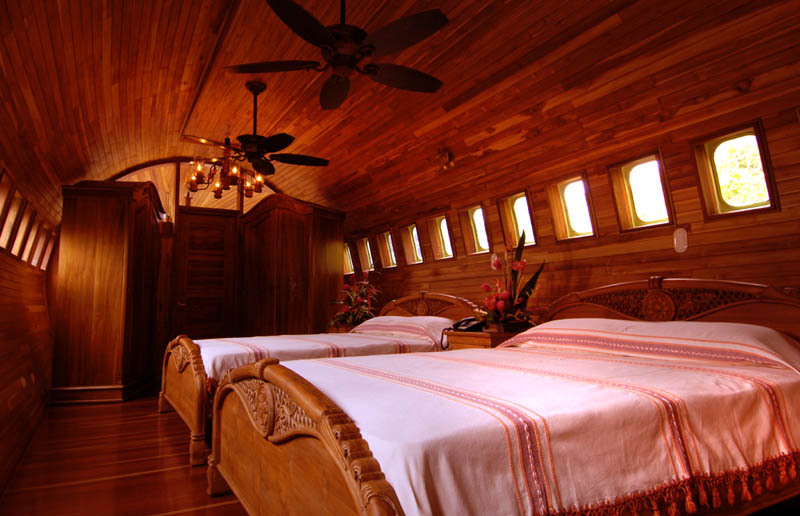 The deck entrance combines the simple wood and high tech plane in a beautiful way. Doesn’t the bedroom look like a place you’d feel comfortable? 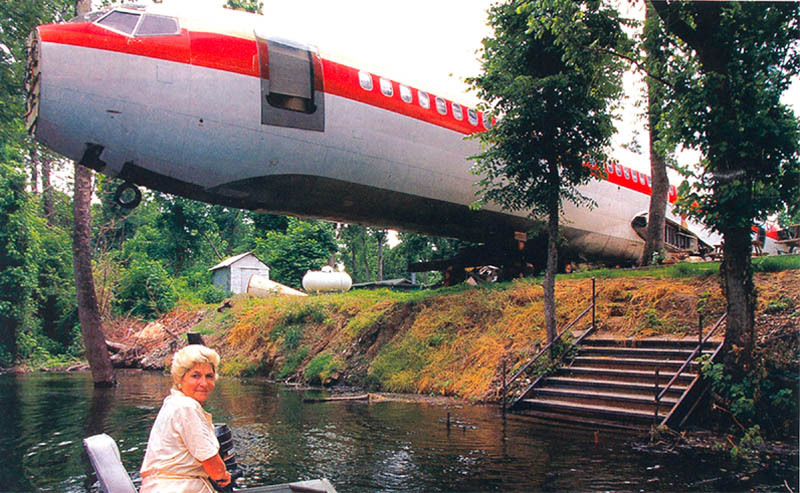 On the other hand, this Boeing 727 in Mississippi is cool but just doesn’t have the same flair. You can see more plane conversion photos if you’ve liked these. 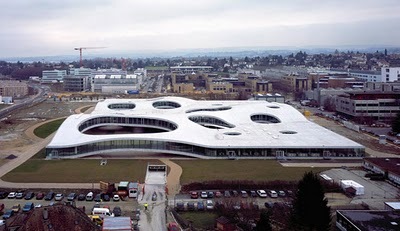 The Rolex Learning Center in Lausanne Switzerland completed construction on February 22, 2010. It’s the flagship building for the EPFL Institute of Technology. 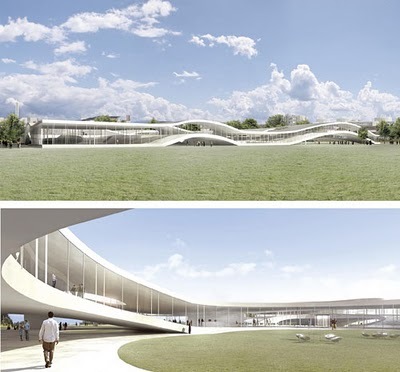 EPFL held a world-wide architectural competition and selected the Japanese firm SANAA. The organic, curvilinear building looks like nothing I’ve ever seen. The architects state in the video below that humans move in curves and the architectural form created here follows that concept. They also note that artists and scientists both need to be creative. They have the common task to discover something interesting. If you have a few minutes, watch this fascinating video about this newest Institute of Technology. In construction, we get to pull from both the artist and the scientist within. Do you strive to discover something interesting? I challenge you to take your day, your week, your year to a higher purpose. Don’t just go through the motions to get a paycheck. Don’t sleepwalk through life to get to death safely. Strive today to discover something interesting. I’ve written a few posts recently admonishing you to reach out and help someone. Not sure why this theme keeps buzzing in my brain. Maybe because I have a bit more time to think (thank you Mr Economy) and I’m counting what’s mattered in my life and what’s been filler. All the time and efforts that I’ve invested in others matters more to me than anything else. Relationships trump everything. We saw The Blind Side last night and loved it. It’s the story of Michael Orr, offensive tackle for the Baltimore Ravens. As a brief summation, a privileged (and gorgeous) woman takes in a homeless kid. The trailer below gives the flavor of the movie. The movie encourages me to look beyond what I think I see. I’m challenged, as Goethe said, to treat people not as they are, but as they are capable of becoming. Last week, TBW and I watched Precious, another amazing movie that inspires and illuminates. If you get a chance to see these movies, I hope you also are moved to be the best you. The place to start those changes, then, will be in your relationships. I ask you to think deeply about how you could help someone you know. Perhaps it’s a young pipe layer struggling with staying married. Maybe it’s a two time drug loser who’s begging you for one last chance to be the foreman you know he could be. Those two examples came to mind because two Construction Superintendent pals of mine encountered those exact situations a few years ago and put in the effort to get involved and take a chance. All the lives involved were enriched by their actions. So go ahead, put in the time and take a risk. It’s worth the effort. We all know we need to be careful around high voltage electrical lines, yet an occasional reminder helps. Watch this 18 second video of what happens to a tree branch that falls onto overhead power lines. It really is wonderful to her the moisture singing and see the eruption of flames. If you have a few more minutes, brush up on the helpful concepts on electricity available at ConstructionKnowledge.net. Bruce Springsteen is one of the coolest guys I’ve ever known. I was a sound roadie on his 1978 Darkness on the Edge of Town tour and got to know him a bit. He treated everyone he met with respect and had fun doing it. The tour was over 100 shows and each one was amazing. He’d play for almost 4 hours, with a unique performance each night. It wasn’t canned, it was him giving everything he had. Since then, I’ve always wanted to give everything I’ve had, whatever the endeavor. It’s a great way to live. No excuses, no regrets. Bruce helped others often, sometimes giving, sometimes going onstage and playing with local bands in a bar. He seemed to live in the moment and try to do the right thing as it came up. The video below shows him playing guitar with some kid in Copenhagen. I can imagine him being recognized, the kid asking him to play and someone just catching it on video. If you have a few minutes, watch the video and listen to the words. The story is about a construction worker enduring hard times, financially and emotionally. Does that sound familiar? Let me challenge you right now. If you are suffering through this economy, take the initiative to get to know yourself better and map out a great future life. My book Joyful Living: Build Yourself a Great Life! can be downloaded free and has some more funny Bruce Springsteen stories in it. Or use some other resource to examine where you are and where you want to go. On the other hand, if you are prospering through these times, take a clue from The Boss, reach out and help others. Don’t do it in some grand fashion, just pay attention and learn to feel where the spirit moves you. Learn to spot opportunities to do some good without making it a big deal. Sometimes, it becomes a big deal for others.